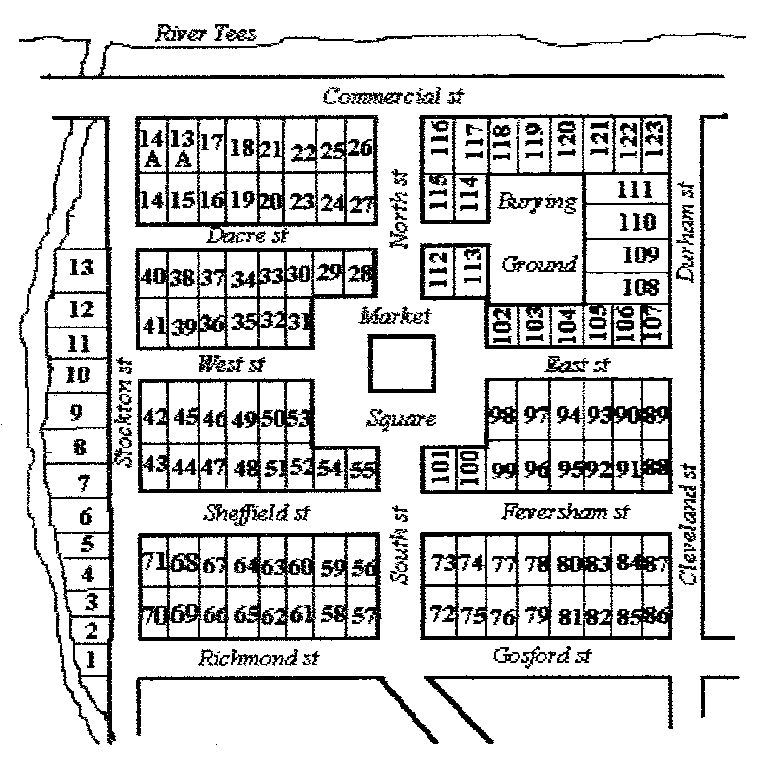 The 1851 census returns for Middlesbrough show only a handful of Irish families living at the Market Place, with no familiar names amongst them, but by 1853 a Bartholomew Monaghan, a labourer, and his wife Mary were living at the Market Place Middlesbrough, where their son Michael was born on 29 June of that year. Bartholomew Monaghan’s life was interesting because his movements seem to symbolise the migratory patterns of his fellow Tyrone iron workers. First setting in Newcastle/Gateshead, then moving to Consett, before moving to the new iron works on the north and south banks of the Tees, at Port Clarence and Middlesbrough. A report that a woman had bewitched two sickly children became so generally accredited among women at Middlesbrough on Tees that on Monday evening week, a great crowd assembled before the supposed witch’s door and uttered cries of “pull her out” “burn her” &c. Ultimately the disturbance became so great that four police officers were brought from Stockton to quelling it; and six or seven of the mob were lodged in the lockups. Bartholomew and Mary Monaghan’s was a much travelled family. Bart. Monaghan, a labourer, married Mary Mitchell, after banns, at Newcastle on 6 August 1850 at St Andrew’s Anglican Church in Newgate St Newcastle. Both bride and groom’s address was Causey bank, just off the Quayside. Bartholomew was the son of Michael Monaghan, a mason; Mary was the daughter of John Mitchell, a joiner. The witnesses were Thomas Irwin, and John McGinnis. I’m not sure why the couple married in the Anglican Church, as all their children were baptised Catholics. On 27 February 1850 a Bartholomew Monaghan reported the death of Bridget Monaghan (11 months) at 178 High Conside (the old name for Consett). Bartholomew’s presence in Consett in February 1850 raises a question about where he really lived at the time of his wedding. On many old marriage certificates the bride and groom are shown at the same address, this was the case with Bartholomew and Mary. Were such couples cohabiting? 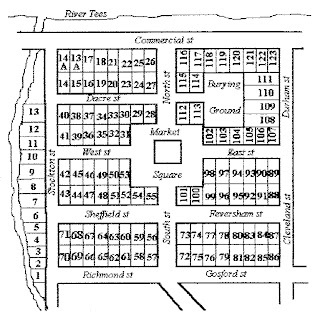 It’s very unlikely that they were; the explanation for the shared address is that a fee had to be paid for banns to be read, and the fee was doubled if two parishes were involved. So many couples, living in different parishes gave an address of convenience as their address. At the time of the 1851 census a John McGuines (23), born Ireland, occupation farmer’s son, was a visitor at 4 Berry Edge (Consett), the home of Thomas Irwin (44) an English coal miner; - the same names as the witnesses at the Newcastle Monaghan Mitchell wedding. I think Bartholomew may have lived in Consett, possibly as a lodger with Thomas Irwin at the time of his wedding in 1850. Bridget, the baby who died at Consett in 1850 was Bartholomew’s baby sister, the daughter of Michael Monaghan, mason, Bartholomew’s father. The baptism register of Our Lady’s, Brooms, shows she was born on 25 March 1849, the daughter of Michael Monaghan and Anna McNamy. Census returns for Port Clarence, where the family later lived, show that this family of Monaghans were from Kildress, Co Tyrone. Bartholomew and Mary’s first child was their daughter, Ann, born on 10 November 1851, at 128 High Conside, and Knitsley (Consett) and baptised at Brooms, Leadgate. The sponsors were Dan Donnelly and Mary Monaghan, presumably Bartholomew’s sister. As mentioned above Michael Monaghan was born on 17 July 1853 in Middlesbrough and baptised at St Mary’s Church in that town. John Monaghan was born at Port Clarence on 24 June 1855, the son of Bartholomew, ‘a common labourer’ and his wife, Mary Mitchell. I haven’t found the record of John’s baptism yet. 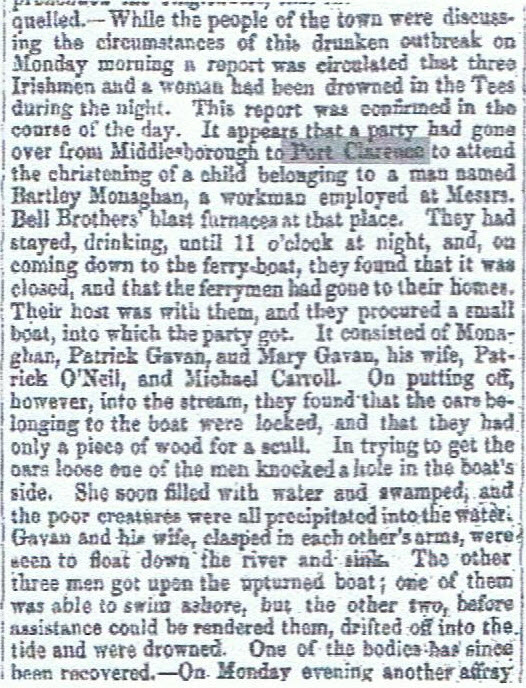 In July/August 1855 several national newspapers carried reports of the drowning of four people in the Tees after the celebration of the christening of a child. The death of Bartholomew Monaghan was reported by J Settle, the Stockton coroner, on 19 September 1855, he had drowned accidently on 22 July, two months earlier; presumably it took some time for the body to be found. The death certificate of Patrick O’Neal (50), 22 July 1855 gives more detail. Patrick, like Bart a ‘labourer at iron works’ ‘accidently drowned by the upsetting of a boat in the river Tees’. 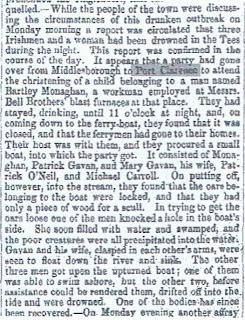 Deaths of the other people named in the newspaper article were not reported* and by 3rd of August the Newcastle Courant was reprinting the story, with the omission of any names, and a figure of 2 men and 1 woman drowned. However, if the bodies were not recovered the other deaths could not be reported. In a sad postscript, the six month old John Monaghan, the baby who had been baptised, died at Haverton Hill on 18 December 1855. Michael and Ann were living with their uncle Joseph Monaghan and grandmother Ann Monaghan, in Port Clarence, at the time of the 1861 census. A Mary Monaghan died in Newcastle in 1857, I will check to see if she was Bart’s widow. * The Betsy Ann Garvan whose death was registered in Sept 1855 was a child.